I need to see one in person before I decide how I feel. Then test the macan and you will know the answer. Its that good. The ONLY thing i had to say about the macan is that its not tall. Its more x1 in height than x3. But thats its. Engine superb. Handling/steering beats any bmw except MAYBE new m3 but close. Sounds good too (no fake cabin noise) and interior is light years away from bimmer. I will miss idrive it does have too many buttons. Love those lights and those wheels! US will get ugly Orange reflectors inside of headlights ... Priced out the Macan and this one and they are close (Very Lightly Optioned Macan) but will wait for the 4 cylinder Macan to arrive before I make any decisions as Porsche does not discount their pricing as aggresively as BMW therefore its still pricier. My wife chose the Macan over the X4 - Macan S arrives in October. Looks better in real life pics. BMW X4 photos taken in the afternoon to my dealer in Reims (FRANCE). I am not disappointed, X4 is very successful. You didnt consider the macan? The real thing and pictures are different. Remember the pic of the girl/lady compared to the real deal, not always the same. In pictures, many disliked the new X5 (F15 compared to the E70). Not many complaints now. For me. I like the X6. 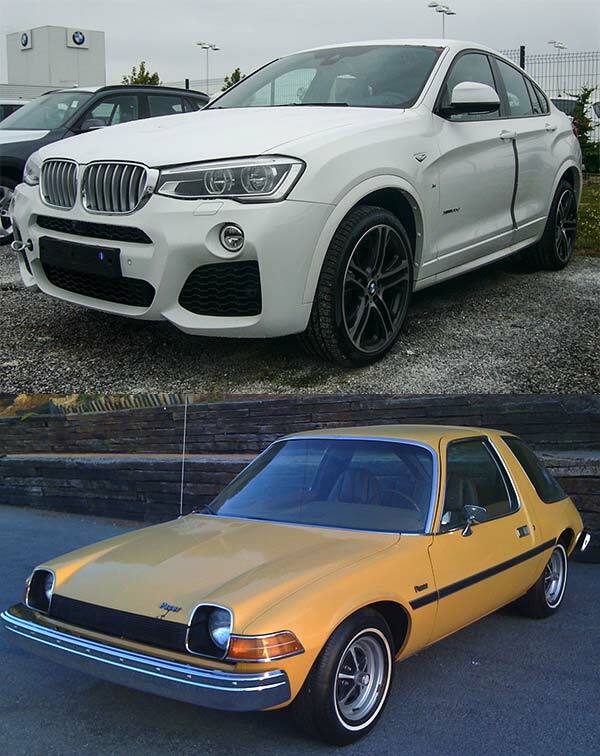 For those who dislike the X6 might just be inclined to similarly think the same way with the X4. Performance, those that own an X6, say that the ride is better than an X5. Similarly, I expect the X4 to ride better than the x3. As a previous owner of 2 X6's, I'll have to wait and see this live and up-close.. But the out-dated interior is big head-wind for me right off the bat..
As far as the comparisons to the Macan? All I know so far is that a relatively modestly equipped Macan is going for about $950/mos lease with a $5k cap reduction..At least those are the #'s I was tossing around with the dealer about a month ago. But the Macan is a hell of a nice vehicle and fun to drive..But boy you pay for that if you lease one. That wheel gap is atrocious!!! I had my X6 dropped on KW coils, and though it was bad, no where near as significant as that from what I can remember. Perhaps because this is smaller it is more pronounced? Wonder if it still has the shipping blocks in it? Not feeling the front at all. Maybe it'll grow on me... Like herpes. jeez i really can't get over what a big disappointment this thing is over the concept. was so looking forward to it. I've been saying the same thing since I got to see it in person the other day. It's just so........ Blah, meh, so so, etc. I ask myself, why? Yes, I can really see the resemblance. hey Yocal.. What's that second yellow car?? A Macan?? Great post! I'm with you!! You're on crack if you think _any_ SUV can outhandle an M3, 4, 5, or 6. Even more so, that's a funny joke when comparing the Macan to the 1M or M235. Apples and oranges dude. Perhaps i wasnt clear. I was only saying about steering feel. Of course the m3 feels more rigid. However steering feel vs m235i (i mentioned current lineup so 1M was never mentioned) and m5 m6 i drove all of the above and steering feel the porsche. By a small margin but you get more sense of what wheels are doing, and this despite the 4wd. The m3 esp is better but not by much. And crack is more of a US of A thing. We are more into coke this side.